Thu. & Sat., Feb. 6, 8 HUDMO's first project this year is helping at WAMC's fund drive. WAMC/Northeast Public Radio, located at 318 Central Avenue in Albany NY, is a regional public radio network serving parts of seven northeastern states: New York, Massachusetts, Connecticut, Vermont, New Jersey, New Hampshire and Pennsylvania. Financial support comes from listeners who contribute annually in fund drives and other appeals, underwriting by businesses, grant support and governmental sources. Volunteers are needed to answer phones and take pledges. February 8, 5:00 PM to 9:00 PM. Members and friends volunteering please email me, Saundra Griffin by February 1, 2014. Indicate the date, time and a contact phone number. 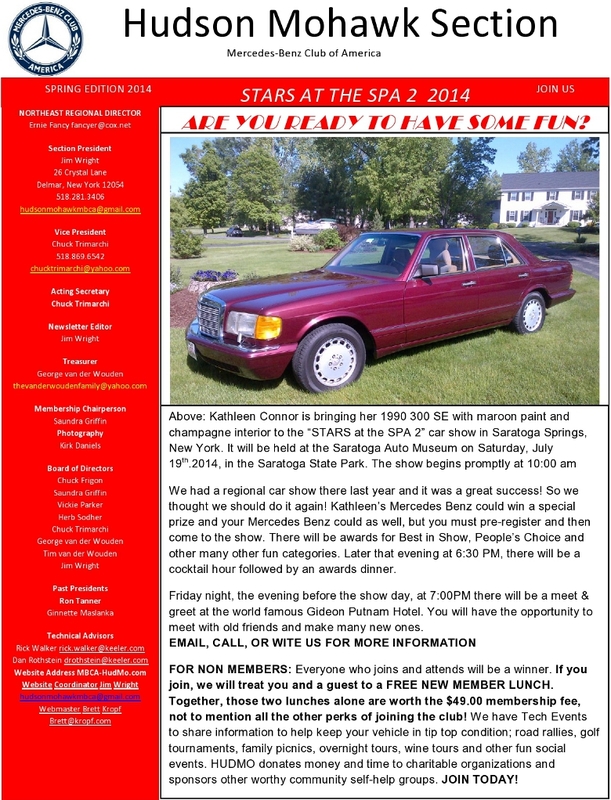 Keeler Motor Car Company's 7th Annual Indoor - yes, Indoor - Sidewalk Sale is back! Once again, we'll have hundreds of New and Pre-Owned vehicles at special event pricing. All of our pre-owned vehicles are inspected by Keeler Motor Car Company, which provides over 40 years of auto buying integrity. Keeler Motor Car Company's 7th Annual Indoor Sidewalk Sale. Why shop for a car in the cold? Follow the footprints to our warm showroom and save! Sat. Mar. 1 - 1:00 PM - Our first regional meet and greet at Shadows On The Hudson. On the east side of the Mid-Hudson Bridge. Shadows on the Hudson (overlooks the Hudson). Werner Stiegler is your host. All members are welcome to attend. It will help with your cabin fever! It will be about factory scheduled maintenance and Q&A based questions that are submitted to me a week before the event. Rick Walker will be handling the tech stuff and answering your questions. Keeler will be providing bagels, donuts and coffee. FREE for new members who joined since April 1, 2013, and 1 Guest! Briar Creek Golf Course 2347 Pangburn Rd, Princetown, NY 12056. Any ability golfers are welcome as a scramble is a fun time. Fun Prizes will be given at the end during dinner. • Prizes: Winning 4-some, Men and Women closest to the pin, Men and Women longest drive, and other surprises. Directions are available at their web site. Saratoga Race Track 267 Union Avenue, Saratoga Springs NY, 12866. Labor Day - Mon. Sep. 1 - A Day at the Races: Annual Labor Day Lunch Buffet - DISCONTINUED! Due to "the new Saratoga Race Track administration", the Labor Day Buffet has been discontinued. Although arrangement for alternative solutions were unsuccessful this year, the club will strive to have a fun-filled event in 2015. Mark your calendars for this two day event in New York's Finger Lakes! All members invited to Schoharie. We will begin in the Albany area for a caravan tour to Geneva, NY in the heart of New York's wine region. Those wishing to drive without touring can meet us at the tip of Seneca Lake where the fun weekend will begin. We will gather at the beautiful Ramada Geneva Lakefront Hotel (315) 789-0400. 41 Lakefront Dr. Rte. 5 & 20 Geneva NY 144456 Friday afternoon at 6PM for a Meet and Greet with free tasty hot and cold appetizers and a cash bar. Accommodations: The Geneva Ramada Lakeside will be our host hotel for the weekend. Room charges are not included and you must make your own reservation. A limited number of rooms have been blocked for us with a special rate of $150 inside and $160 lakeside per night for double occupancy. Details, times and reservation info will be sent to all who register for the fun adventure. On Saturday morning we will rally from 9:00 AM to approximately 11:30 AM. We will then board our 34 passenger luxury bus with bathroom and leather seats (website http://www.linqserv.com/). Box lunches will be served at noon. We will return around 5:00 PM in plenty of time to freshen up for dinner. While the exact wineries are still being determined, they will include the best in the region of over 80 vineyards. Saturday evening we will assemble for a wonderful three course meal and some light-hearted Rally awards. Cost: $150 per car ($75 for each additional person over two.) Included in the per car cost is: Friday night's Meet and Greet, Saturday's Rally, Box lunch and Winery Tour, Saturday Evening dinner and Awards Presentation. If you take the caravan scenic route on Historic Route 20 there will be many interesting things to see, making getting to the Ramada Lakefront Hotel very enjoyable. Route twenty used to be the fastest way to get to Buffalo New York. Saundra Griffin, our membership chairperson will be hosting an expedition on Sunday to the nearby outlet shops. Come join her for the Shopping Caravan! Eat Sunday breakfast and then go to the Waterloo Premium Outlet Mall. Share all your great finds over lunch. Shop designer fashions Ann Taylor-Jones New York, Coach, Brooks Brothers, and Chico's. the Annual Holiday Party at Albany Marriott. 189 Wolf Road, Albany, NY 12205 Served in "State Room" $50 per person. This page last updated at 23:51:35 EST on February 21, 2015.